I prefer to eat local in a new city. It’s one of my favourite things about travel. How interesting it is to learn how food has shaped a country through years of history, cultural influences, weather, local crops. Haha! Not quite how you’d expect me to start. My favourite drink in Sri Lanka was Milo. I’m certain it is the island’s favourite drink too. Because every second shop in SL plonked a cardboard cut out of cricketer Angelo Mathews with a Milo. I was fed up of seeing him everywhere. But it’s true that I was obsessed with Milo and kept one ready-to-drink pack in my rucksack all the time. It filled me on bus journeys along with the fruits I sneaked from the breakfast table. I’ve been a fan of Milo since school. I wonder why they don’t sell Milo in India anymore. Did you know, Ceylon was the former name of Sri Lanka under the British rule? SL is one of the largest producers of tea in the world. They grow tea of all sorts from black to green and even white. 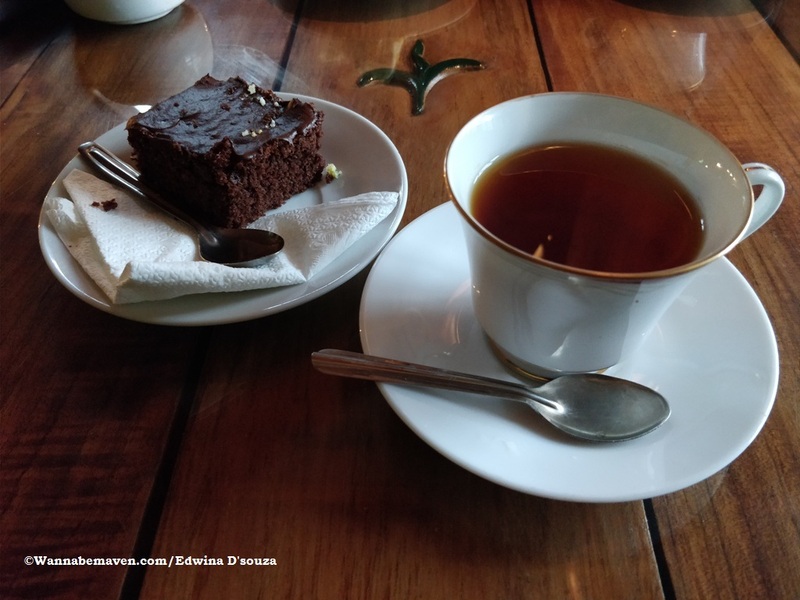 I took a free tea factory tour of Mackwoods (Labookellie) in Nuwara Eliya in the central highlands. Post tour, a complimentary tea tasting was organised in their cafe. The weather was nippy and the occasion called for a chocolate cake too. Try it, goes well! It’s noteworthy that although Sri Lanka like India may be a tea drinking nation, there are NO roadside tapris anywhere…something I missed! 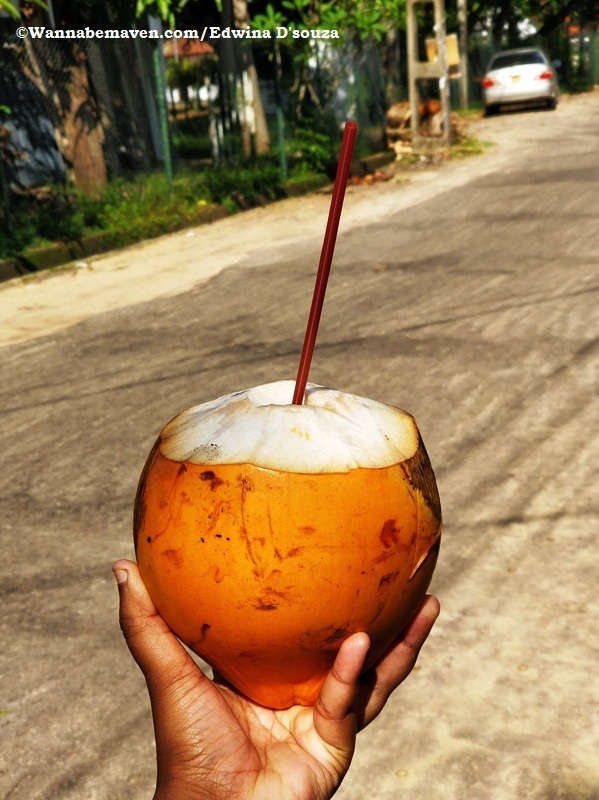 Sri Lanka’s version of coconuts looked so cool – bright orange and they’re found literally everywhere from beaches to highways. All the while I kept saying, I’ll have the king coconut later but it never really happened until the last day, on my way to the airport. Nothing to comment on the taste…haven’t you ever tried a coconut? I really wish I had tried Sri Lanka’s local spirits Arrack and Toddy. Both derived from coconut palm sap. The only difference is that arrack is the first distilled version and hence strong. Toddy is milder. I’ve tried toddy in India. Even Arrack is a common drink in Kerala and some parts of Goa, so no hue and cry. Roadside carts, Pop up stalls, bakeries and grocery stores all sell short eats which is snacks on the go. The Parippu (Dal vade) was just awesome and very crunchy. I also loved their take on Ulundu (Medu vade). They slit it and added local chilli paste – went well. These were served in paper cones along with chopped onions and tempered dried red chillies. Other short eats I tried included pastries typically with chicken, mutton, fish, egg or vegetable stuffing. It was really tasty although the coat of flour was very thick for my liking. I’m also going to mention the chicken hot dogs with caramalised onions. Too good! The vades would typically cost 10LKR per piece while the pastries and hot dogs went up to 50LKR per piece. The real deal would come with rice, fish curry, dhal, 2 to 4 types of vegetables, sombol, mango chutney and poppadom. I tried the full course at Mama’s Cafe in Galle along with a ginger beer. Mama’s Cafe rated very high on Tripadvisor and Lonely Planet. Although in my opinion, the food was ok. The dhal came in cold. But they didn’t make a fuss to replace it. I liked the seer fish curry rice at Sunny’s Beach Restaurant in Hikkaduwa on my second day in Sri Lanka. It was simple and to the point with no fancy vegetable and chutney accompaniments which I anyway end up wasting. The seer fish curry rice at Sunny’s was for 350LKR (175 Rs. ), while the one at Mama’s cafe in Galle was for 850LKR (425 Rs.). This really isn’t a Sri Lankan local, but I’m adding it because I tried Chicken and Chips quite a few times, especially when I got bored of the Sri Lankan fish curry rice (can’t eat it every day no). However, I really thought Sri Lankans couldn’t do fried Chicken and almost always burnt the bird and dried its juices. 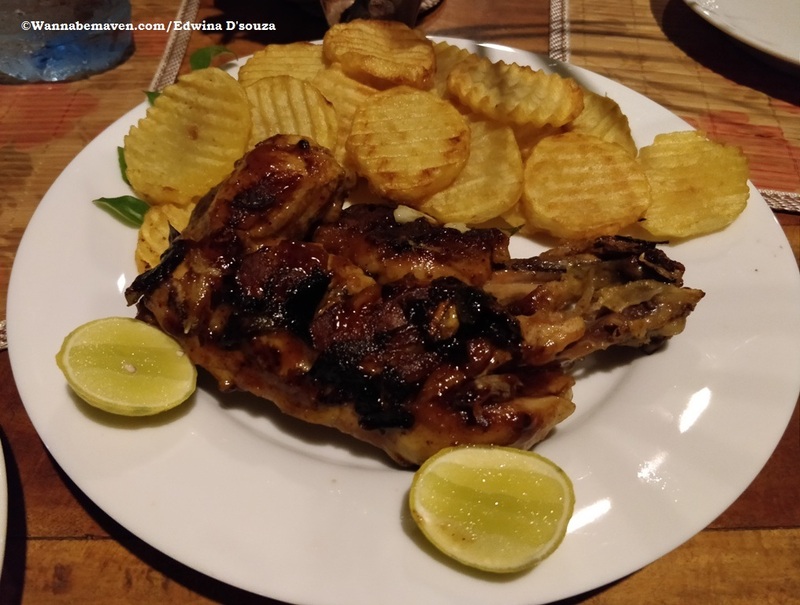 On the entire trip, there was only one place where I ate awesome chicken and chips – in Rekawa when we went for a midnight turtle watching expedition. That chicken and chips was homely and cooked with lots of love. A roti shredded and stir fried with vegetables and egg, chicken or cheese depending on your liking. It looks like fried rice but with chopped roti instead. 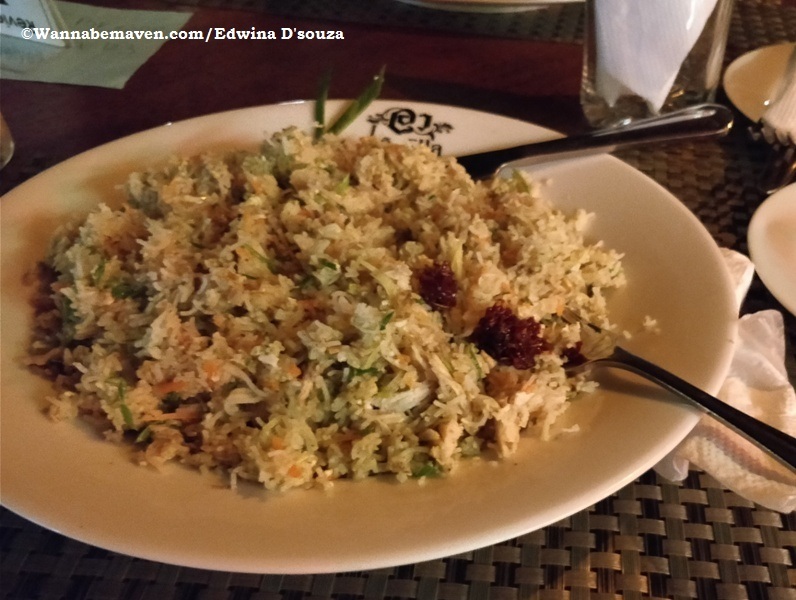 I tried the chicken kottu roti in Ella and wasn’t really impressed, but I kept it to myself. Then I met two other travellers from Singapore – Rai and Supriya at the Nine Arches Bridge who said that the Kottu Roti was overrated, and I was like, ‘Yeah! I totally agree’. 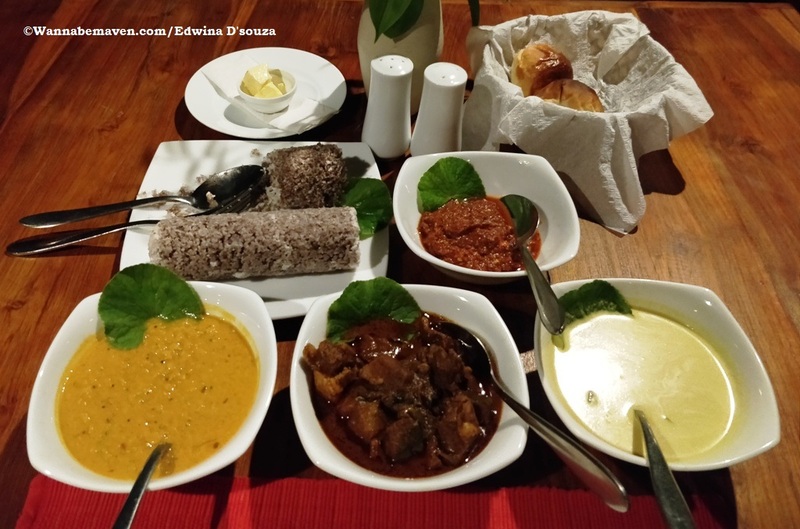 It was through Rai and Supriya that I got to know of the Kandyan Muslim hotel in Kandy where I tried the beef roast with Sri Lankan style dhal, 2 types of vegetables and rice. A no frills budget restaurant but the beef roast was damn good. Marination had seeped through and the spice quotient was just what an Indian traveller would seek. I paid 350 LKR for that lunch (about 165 Rs.). Sri Lankan version of rotis are thick like a disc and came in a variety of stuffing like coconut, egg, nutella, chocolate, honey, banana and what not. 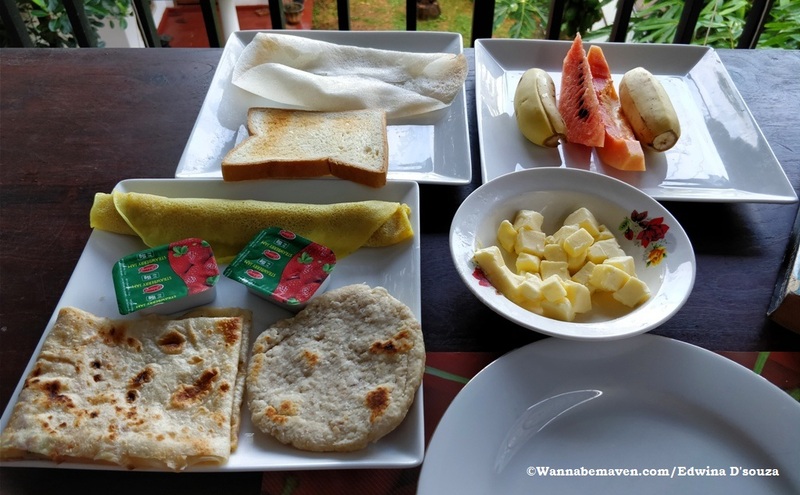 I had the best breakfast rotis on the entire trip in Anuradhapura at my hotel for an additional 4$. The meal included a Hopper, coconut roti, pancake with honey and coconut stuffing, egg roti, toast, butter, jam, cut fruits and tea. Throw in a nice lake view while stuffing your face with all that food. Good life! Dad used to visit Sri Lanka every second month for work. So he mentioned that I must try Lampraise. It’s a Dutch influenced recipe from the 17th century when SL was ruled by the Dutch. I call Lampraise the holy mess. It’s got rice, chicken, mutton, brinjal, slice of jackfruit, a full egg, and a fish ball thrown in. Some restaurants would serve this as a ‘Sunday only’ dish because it’s difficult and time consuming to prepare. 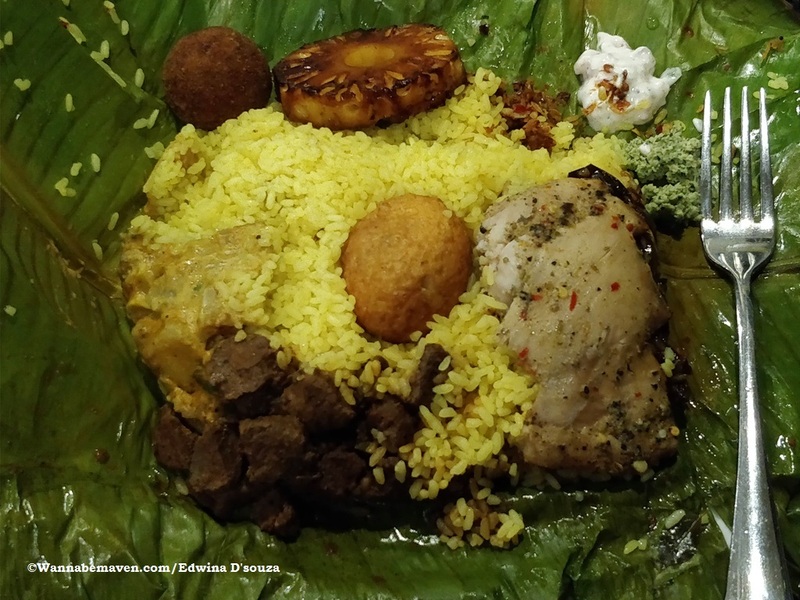 All the elements are cooked separately and then put together in a banana leaf and baked before it is served. I didn’t find many restaurants serving Lampraise but my hotel chef at Twenty-Two Welligambay in Welligama obliged to prepare this for us with a day’s notice. How did it taste? Bloody damn good! Hoppers or Appams are fermented batter of rice flour either pan fried or steamed. These come in variants like egg hoppers and string hoppers (idiyapam) and are a very popular breakfast in Sri Lanka. They are best eaten with Pol Sombol which is a concoction of grated coconut and red onions with a dash of red chillies, salt, pepper and lime. I loved the Pol Sombol at Twenty-Two Welligambay. 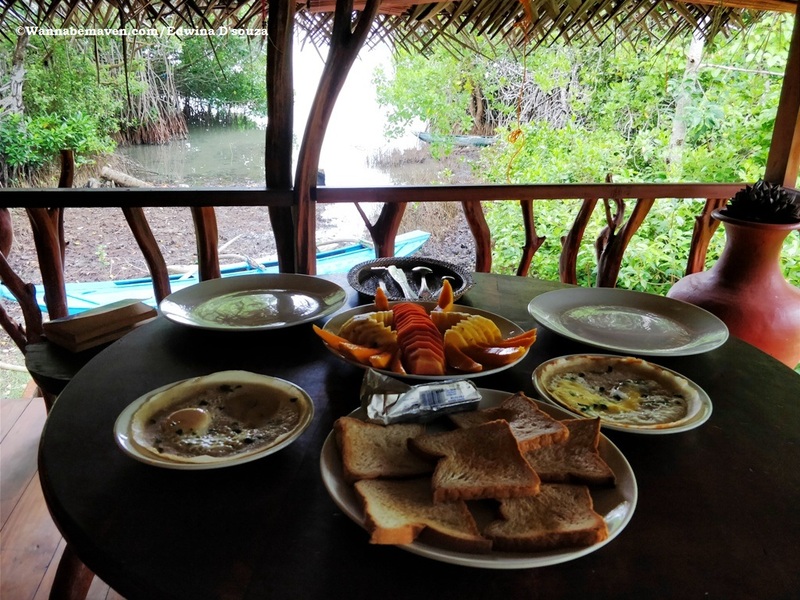 Also my host in Rekawa made the best egg hoppers on the trip, which we ate in our balcony overlooking the Rekawa Lagoon. It goes without saying that when in Jaffna you HAVE TO try the Jaffna crab curry. It’s a rite of passage to the city. Big bold flavours make up this dish. You may want to tell the staff how spicy you’d like your curry, else they’d assume your endurance to spice is pretty good. 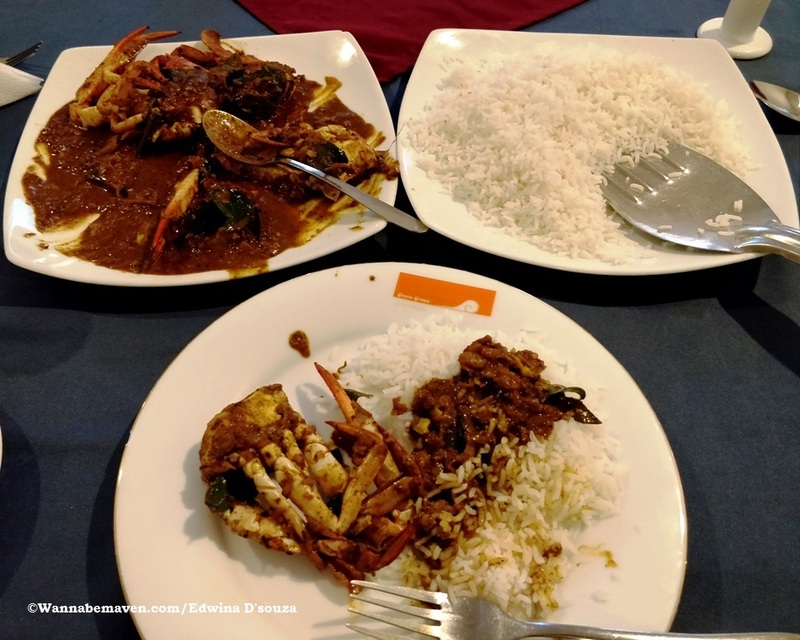 I tried the Jaffna crab curry at Hotel Green Grass for 750LKR. Other options include Hotel Rolex and Hotel Cosy. Tip: Bring home the roasted curry powder from Jaffna. Makes for great giveaways too! On day 2 in Jaffna, I stuck to soup as I was unable to finish all the food I was ordering. Here’s when I tried Kool – a sea food broth common to the town. Kool was really ‘cool’. I mean the soup had chunks of cuttle fish (squids), prawns, crabs and seer fish. It was thickened with palm flour and had a south Indian flavour, which is obvious because of the strong Hindu Tamil influence in the region. 9 days into the trip, I was longing to try something different and that’s when my host at ‘The Other Corner’ in Habarana prepared me pittu and pork curry for dinner. Pittu is steamed cylinders of ground rice with a layer of grated coconut. Back in 2016, I had tried a breakfast version of pittu with a spicy chick pea curry and pol sambol in Kochi. 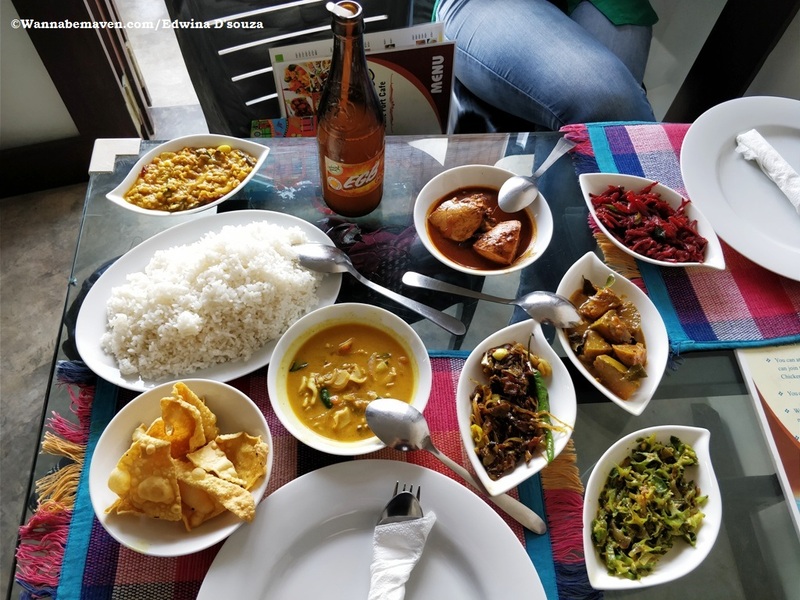 But the pittu in Sri Lanka was great too and went excellent with the pork which is a common protein in the central highlands, while sea food dominated the coast. Both were a Sri Lankan-South East Asian fusion and a very popular fast food take away in Sri Lanka (except the Northern Province). The sea food rice had generous pieces of cuttle fish, prawns, seer fish and egg. Local chilli paste and mango chutney came in as a sider. 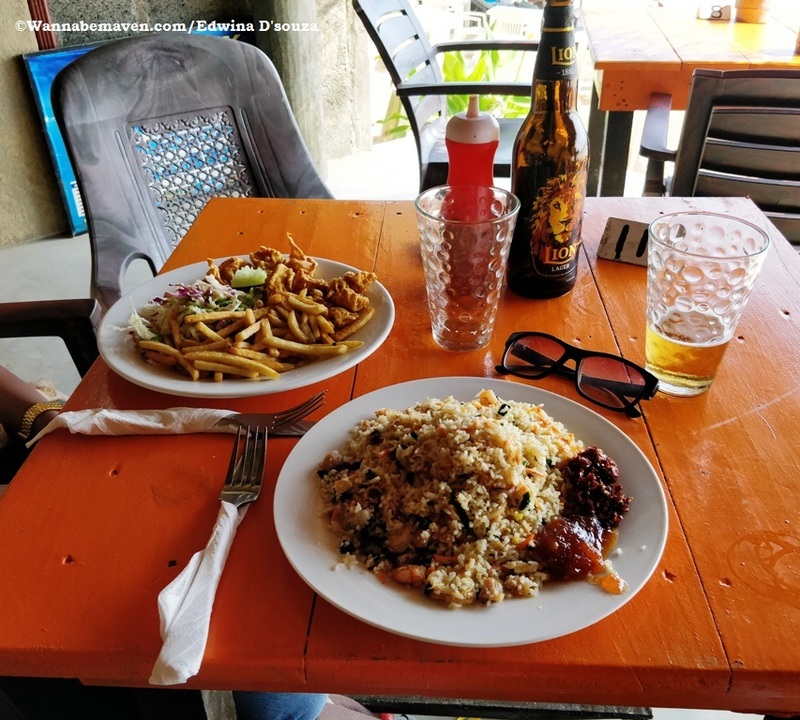 I tried the sea food rice at Wadiya’s in Mirrissa, a recommendation by the folks from whom I rented the tuk tuk…didn’t disappoint. The deviled prawns was cooked with onions, bell peppers and tomatoes and reduced to a sweet sour sauce. 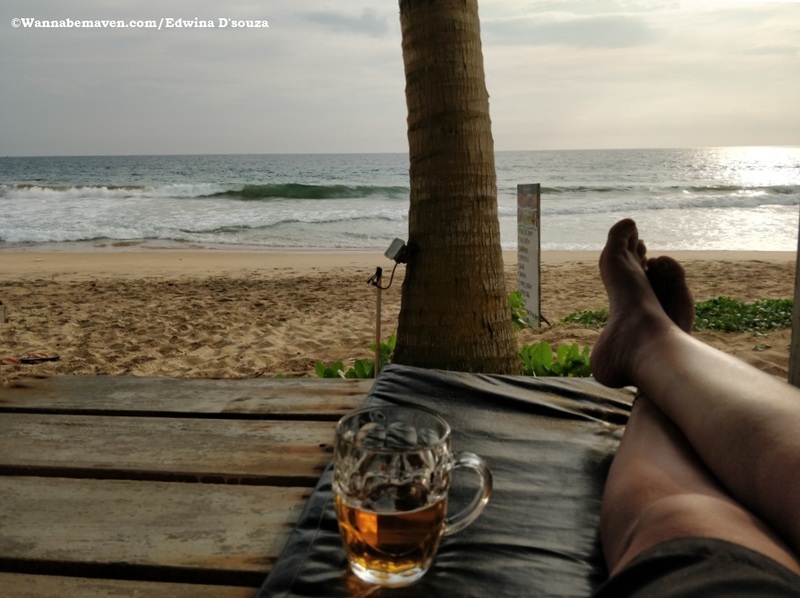 I’d recommend it at Sunny’s Beach Restaurant in Hikkaduwa. In March 2017 in Trivandrum, I tried Wattalapam at a restored Dutch mansion turned into a heritage restaurant. Who knew that same year; I’d end up in Sri Lanka trying it all over again. I liked Wattalapam then, and even now. 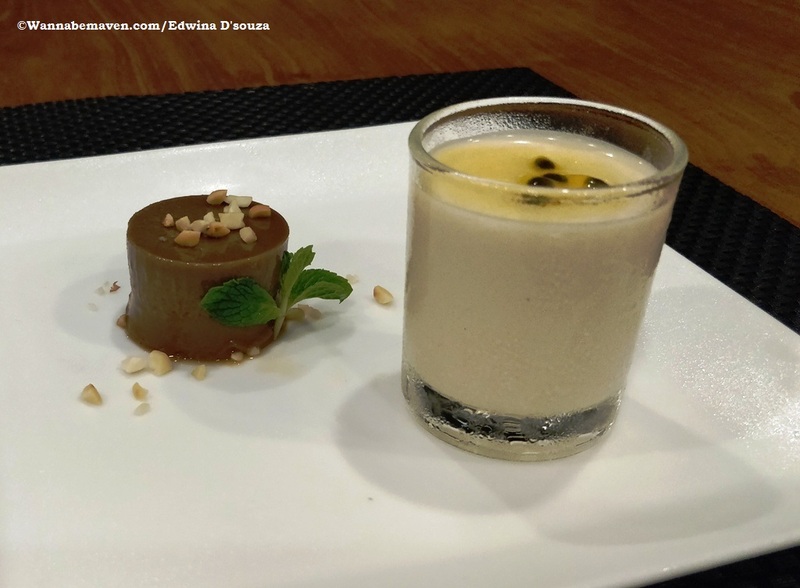 It’s comfort food of jaggery pudding with passion fruit pannacota on the side. 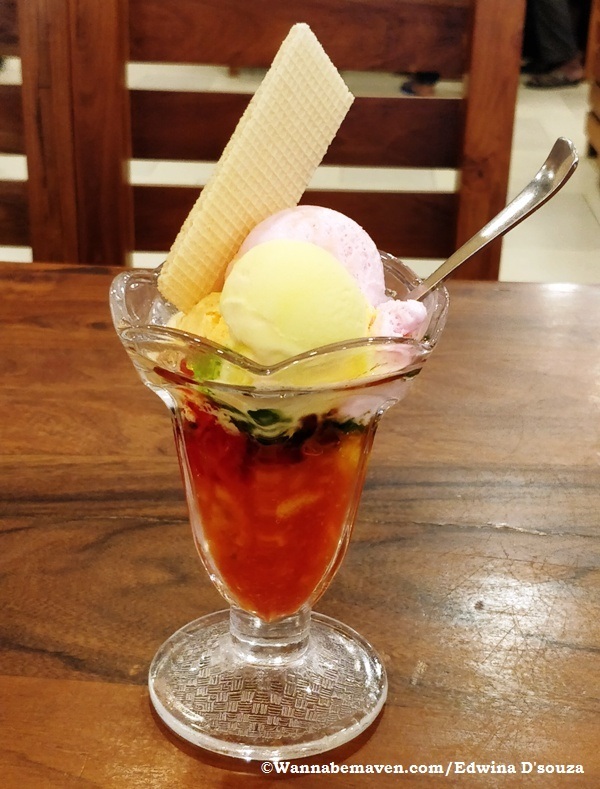 Sri Lankans pride in this dessert and most will insist you try it if you’re a first timer in the country. Kithul Treacle is a maple syrup substitute in Sri Lanka, derived from the fishtail palm sap. The coffee black dessert has a smoky flavour and is best eaten with buffalo curd or yogurt. I was lucky to try the Kithul treacle with curd for breakfast on the last day of my trip in Negombo at the in-house restaurant at ‘Waterland’. 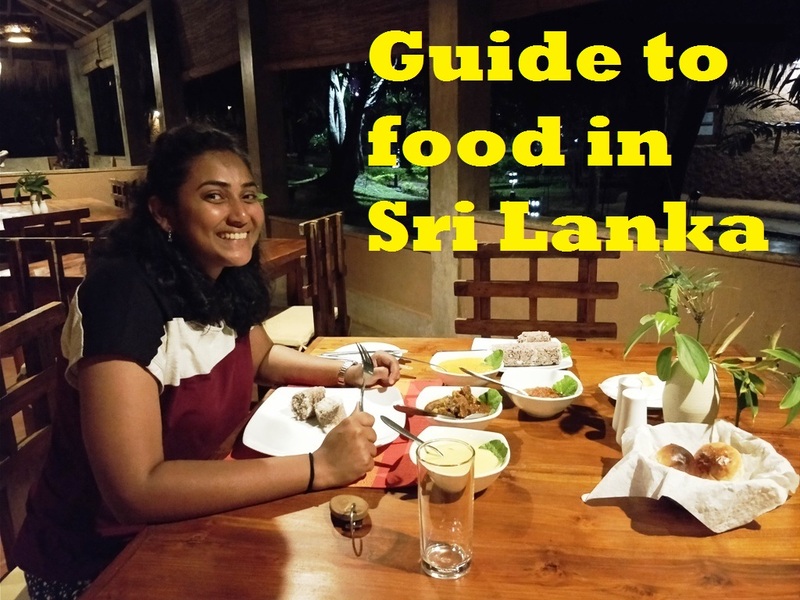 backpacking, Food, food guides, Food in Sri lanka, Food Trail, South Asia, Travel. Bookmark.